The widow whose monetary-mite is praised in the gospel; Blessed Pier Giorgio Frassati as a young boy giving away his socks and shoes to a younger boy who had none; Jesus who stretched his body on a cross but continues to give what is most needed to those surrounding him; our yearly response to a missionary priest passing through for a weekend of Masses; our fifty-four years of proclaiming and living faith at St. Brendan … all of these have at least one thing in common: generosity. There are a number of ways in which generosity is offered: in the time we give, in the talents we offer, in the treasure that we share. When we do this it shows that we care, and even more profoundly, it shows that we take to heart our common call to follow Christ. In the season of fall, our Sunday Scripture readings turn our hearts to look deep, to do some self-reflection. It is a good time of the year to do so. 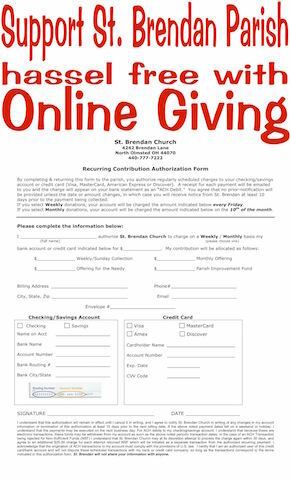 Each year in the month of October, we will be asked to take some time to reflect, examine our conscience, take stock of our lives and consider a question: How am I living the call to generously give of my time, talent, and treasure to my faith community of St. Brendan Church? I ask that you especially consider if you are able to participate in this year’s first annual collection enhancement. Our last offertory enhancement was accomplished ten years ago. The offertory is the largest source of income for our parish community. This resource is utilized to staff our parish office and school, as well as, to maintain our aging facilities. It is also a way for us to keep our school tuition and PSR fees at a minimum cost since our parish subsidizes these major ministerial programs for our parish children. I am grateful for the support that you have given to the parish over the years. I ask that you now prayerfully consider if you can possibly give more in your collection contribution. If each family in our parish were able to give a 10% increase, this would give an additional $70,000 to help our parish keep up with the cost of living since our expenses have been exceeding our income. Please use the brochure that is enclosed. Take this to prayer. May it be an instrument to help you consider the virtue of generosity in the way of giving your time, talent, and treasure. Please fill in the area of commitment and return it to the parish office by placing it in the collection basket over the weekend. Thank you again for your generous support, and may God bless the work that we do at St. Brendan Parish. 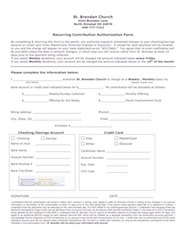 Print, complete, and return for your contributions to be withdrawn weekly or monthly. God bless you for your generosity.